The Gospel reading for the Sunday of the Last Judgment is about hell and eternal life, or more generally about the future life, or better on the future existence and non-existence of humanity. Often we hear that heaven and hell are here and now and we pay for everything here. This is said by people who do not believe in the existence of a future life. However it is also said by religious people and even Christians, who are carried away by the passion for vengeance against others who did something bad to them and they say, "now they are being punished," considering that since they did wrong to them they are paying for it in this life or in their ignorance believe in a punishing and vengeful God. Those who say such things however are unfortunate. They are unfortunate because the more they believe it the more agonizing their life becomes. Because when they say hell they mean the punishment of bad people and paradise is the reward of good people. Does this always take place? At first sight the reality is that many bad people have been punished in this life and many good people have been vindicated here. But how many good people have lived tormented lives and how many bad people have lived in palaces? History tells us that many Saints were exiled, stoned and beheaded. Even Christ was crucified. Meanwhile criminals and the unjust live a life full of good times. Even today we see virtuous people hidden like a spark in the ashes and the corrupt appear before all as good. Is this hell and heaven? Is this justice? 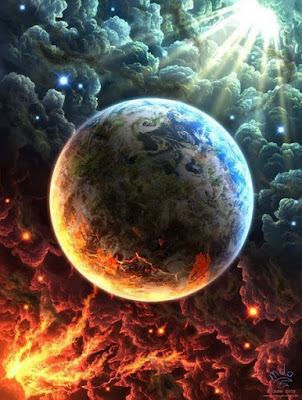 Everything becomes hell or paradise, but it is twisted, for some who live paradise here and now are really in hell and some who are in hell here and now are really in paradise. Therefore many people believe in justice for the world here and now and they become unhappy in their distress for what they have received. Imagine how disappointed is someone who believes with all their might in justice in this present life. Before them they will find injustice, slander, misunderstanding and ingratitude. If they are a father they will be disappointed by the ingratitude of their child, if it is a sincere friend they will find betrayal by their friend, if they are sincere they will encounter slander, if they work to do good they will receive bad in return, if they give life they will find death. How can they comfort themselves? Can they say they did good for the sake of good? But as a result of their good action justice has its requirements, that it should be rewarded. They are not rewarded in the here and now, yet for them another life does not exist. This is a great tragedy. They are unhappy because they are oppressed by the fact that they cannot choke the voice of justice, especially in times of injustice, and they cannot stop being unjustly treated. And in the end they do not believe in justice in the other life. What happens therefore in today's Gospel reading? At that time we will be terribly exposed. People consist of a body and a soul and they make mistakes in their psychosomatic existence, they make mistakes as a result of their excessive love for themselves. We do not want others to know who we are which is why we like to present ourselves differently from who we are. Blessed Augustine gives a nice solution to this, saying that I do not want to know who I really am even though I love myself, because if I come to know myself I might hate myself, since I will hate the dirt and will be humiliated. We do not like to be humble which is why we avoid coming to know our true selves. The future judgment will be self-judgment, it will be an acquaintance with ourselves. We will know our sins and this judgment begins in our present lives, having to do with our relationships with other people. This is not about justice but about loving relationships and relationships where we do not seek our own but that of others, accomplishing the tranquility of our suffering brethren. Lastly, without spatiotemporal limitations, hell is the torment if you do not love and eternal life is society, the encounter with our other afflicted brethren, which are realities experienced in a church congregation, where place and time are abolished and everything is transformed into eternal life here and now.